There was never any doubt in Dr. Jessica Ross' mind that she would set up her practice in Port Perry when she graduated last year. "Port Perry is actually home for me," she said, explaining that her family moved to town when she was young and she graduated from Port Perry High School. Now married to the man she met during undergraduate studies at the University of Guelph, they enjoy life with a bustling toddler in their Scugog Island home. "It had always been our plan to return to Port to work, live and start our family," she explained, and with a number of close friends in town and her parents living near the hospital, where she occasionally escapes for a lunch break, working in her old home town is a perfect fit. Dr. Ross says her decision to enter medicine was a culmination of a number of experiences and the influence of a number of people. One such mentor was Dr. Merrilee Brown, her family physician when she was growing up. "She is a stellar physician and woman, and she was a great influence on me throughout my schooling." Her journey to Port Perry was a long, winding, globetrotting path. After completing her undergraduate studies at the University of Guelph she decided some adventure was in order, so along with her husband they travelled across the world to Adelaide, Australia where she attended medical school at Flinders University of South Australia. "During one of my clinical training years, I also spent several months on an obstetric and paediatric exchange at St. George's University in London, England," she said. Following medical school she returned to Canada and completed her residency training at Sunnybrook Hospital in Toronto. 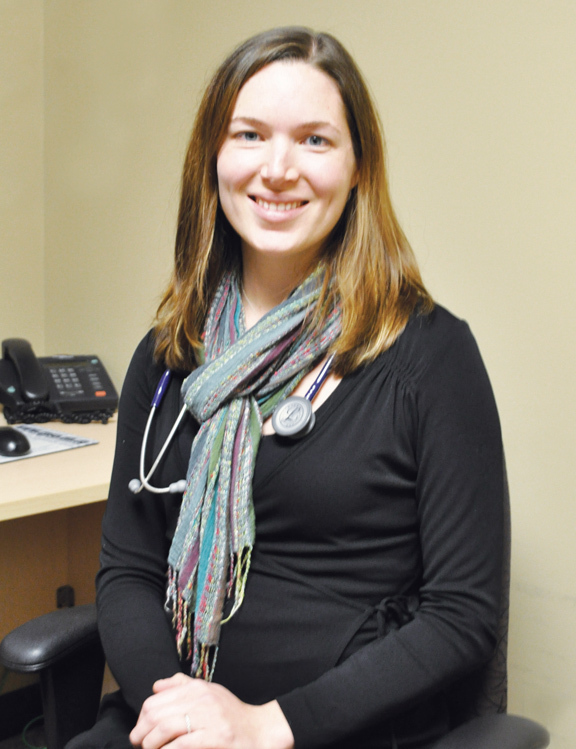 In addition to her family practice at Medical Assoicates of Port Perry, this busy young doctor also works in the ER both in Port Perry and Oshawa. "I find that it's a wonderful mix from paediatrics and women's health to geriatrics; the adrenaline and acuity of the ER is a nice complement to forming long-term relationships with patients and caring for their health through prevention and day-to-day illness experiences," she says. While some new physicians may find working in a small town difficult, Dr. Ross welcomes the change to working in the city. "It is not only nice to see patients in a relaxed, social setting - I find that it also allows you to better understand and treat patients as you can see their health and illness in the context of the lives that they live." When asked, when she has time what other interests she has she candidly states, " I rarely find a spare moment." "To be completely honest, I consider myself lucky if I arrive at work in the morning without sticky finger food art and muddy dog prints on my clothes, and to escape at the end of the workday without an avalanche of paperwork behind me. " And with her husband working shifts, time together is at a premium so they just love just spending time together with family and friends, cooking and being outdoors as much as possible. Now settled in a quaint farmhouse on the Island, she feels content being able to live in the country, and only minutes from work, play and the water. "We enjoy all that the town has to offer," she admits. Dr. Ross credits the welcoming and collegial group of physicians who practice here as her main draw to setting up practice in Port Perry. She says the group forms a wonderful dynamic, and everyone is very eager to teach, learn and work together in the best interest of our patients.